Phoenix, AZ – It is the mission of the City of Loveland to provide services, programs and community engagement with creativity and innovation. Recently, the City of Loveland has demonstrated that effort by increasing the adoption of plug-in electric vehicles (PEVs). 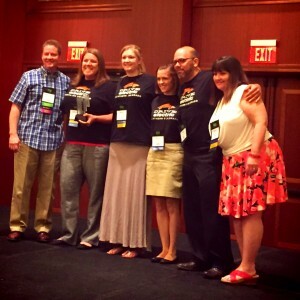 On April 13, 2015, the City of Loveland, through an innovative partnership with Drive Electric Northern Colorado (DENC), was recognized at the 2015 Transforming Local Government Conference held by the Alliance for Innovation in Phoenix, AZ. 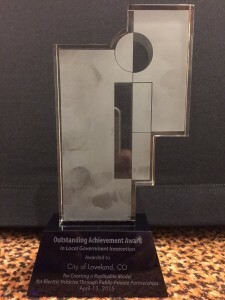 The “Outstanding Achievement in Innovation Award” was awarded to the City of Loveland for “Creating a Replicable Model for Electric Vehicles through Public-Private Partnerships.” Loveland was one of eight local governments selected for the Outstanding Achievement Award from across the United States and Canada. To receive the honor, was Loveland Water and Power’s Customer Relations Manager, Gretchen Stanford and DENC’s Director, Ben Prochazka. Stanford and Prochazka gave a presentation to Transforming Local Government attendees that highlighted the remarkably innovative program and identified several key strategies used for deploying EVs at the local level. In addition to the presentation, 700 conference attendees were offered an opportunity to test drive an electric vehicle. Present at the conference were multiple EV models including BMW i3s, Chevy Volts, Nissan LEAFs and the Ford C-MAX. Hundreds of attendees were able to learn about the benefits of EV and experience them first-hand by taking them for a test drive through the streets of downtown Phoenix. 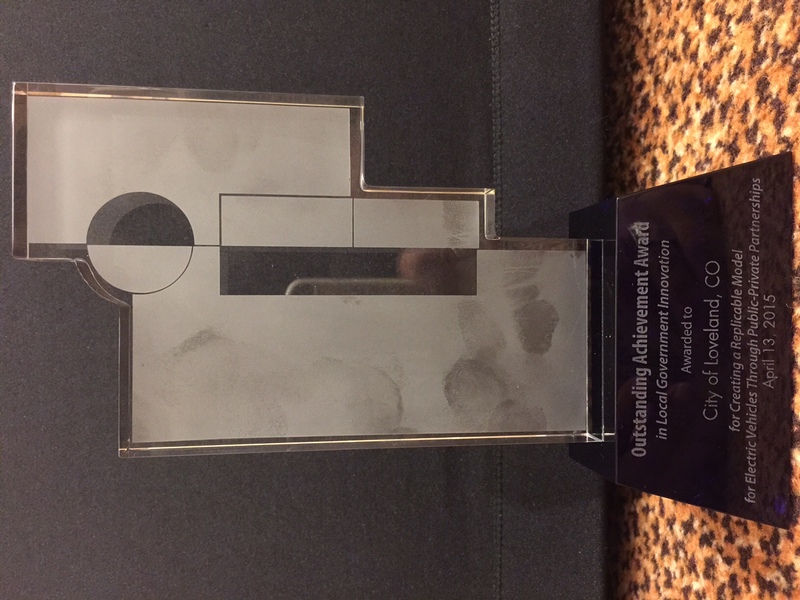 Currently, Loveland is on the leading edge when it comes to EV deployment and their program has been recognized for its positive impact and tremendous benefit to the community. Through this project, the City of Loveland and its residents are continuously learning about the many advantages of EV usage including – cost savings, reducing oil dependency, and reducing vehicle emissions. The innovative strategies utilized by the City of Loveland and DENC continue as a “living laboratory” approach, creating tangible improvements that are directly related to EV deployment. For several years, the City of Loveland and DENC have implemented three core strategies for EV deployment. These three overarching strategies are: 1) EV readiness 2) EV education & experience and 3) Fleet transition. Loveland helped their community become EV ready/friendly by installing the necessary infrastructure in key locations. To date, the city has installed four dual-charging stations and each of these public charging stations are powered by renewable energy and are positioned in high-volume areas including the public library, City Hall, McKee Medical Center and the City of Loveland Service Center. Additionally, the city operates three charging stations for its own electric vehicle fleet. Other aspects of EV infrastructure have involved designating EV parking spaces, EV marketing, and EV signage. Moving forward, the City of Loveland plans to build on this strategy by installing charging stations for workplace charging, giving city employees the opportunity to switch to all electric vehicles. The City of Loveland also works constantly to reach out and provide EV education & experiences for city employees, key accounts, and residents. This strategy has already prompted several innovations such as a City of Loveland “Drive Electric Challenge”, public-private partnerships, and community wide marketing. The “Drive Electric Challenge” gave almost 100 city employees experience with electric vehicles; for example, the Challenge gave them a chance to test drives EVs, urged them to use all-electric fleet vehicles, and even convinced some employees to purchase a personal electric vehicle! Loveland has also partnered with one of their largest commercial accounts to help them implement their EV program. As a result of that partnership, three public charging stations were installed at a Loveland shopping mall. Loveland also conducted EV outreach and education with their residents, by rolling out a several direct marketing strategies to inform residents about the benefits of electric vehicles. Finally, the City of Loveland launched their EV fleet transition in 2011 by adding two all-electric pool cars to the fleet. EVs have continued to serve as a viable mode of transportation for the City of Loveland fleet due to their ever increasing reliability, performance, and range. City owned EVs can be reserved by employees for daily work travel and have a range of over 90 miles (which is 3x the size of Loveland). Building upon this, Loveland chose to switch out their meter reader vehicles to all-electric. By using all-electric meter reader vehicles, the city has reduced fuel costs and produce zero emissions while driving through the community on their daily routes. Loveland continues to see increasing EV fleet usage and is looking to make further fleet transition in the coming years. The world is ever-changing and local governments are the perfect place to cultivate innovative practices that advance our communities and our country. For the City of Loveland, electric vehicles are just one of the many ways they can be proactive, progressive, and innovative and this action has made them a symbol of innovation for cities across North America. Loveland is proud of its employees, local business partners, and residents for helping this community be recognized as an innovator. Together, programs such as this bring the community closer and offer endless possibilities. Only 10 Days Left! Apply for the SAFE Energy Security Prize!